The Right Stuff is a 1983 American epic historical drama film. It was adapted from Tom Wolfe's best-selling 1979 book of the same name about the Navy, Marine and Air Force test pilots who were involved in aeronautical research at Edwards Air Force Base, California, as well as the Mercury Seven, the seven military pilots who were selected to be the astronauts for Project Mercury, the first manned spaceflight by the United States. 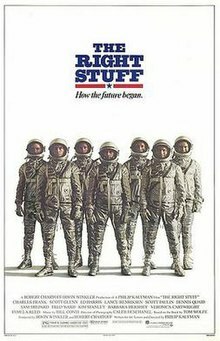 The Right Stuff was written and directed by Philip Kaufman and stars Ed Harris, Scott Glenn, Sam Shepard, Fred Ward, Dennis Quaid and Barbara Hershey. Levon Helm is the narrator in the introduction and elsewhere in the film, as well as having a co-starring role as Air Force test pilot Jack Ridley. The film was a box-office failure, grossing about $21 million against a $27 million budget. Despite this, it received widespread critical acclaim and eight Oscar nominations at the 56th Academy Awards, four of which it won. In 2013 the film was selected for preservation in the United States National Film Registry by the Library of Congress as being "culturally, historically, or aesthetically significant". In 1947, the Muroc Army Air Field in California has test pilots fly high-speed aircraft such as the rocket-powered Bell X-1, but some are killed as a result. After another pilot, Slick Goodlin, demands $150,000 (equivalent to $1,683,000 in 2018) to attempt to break the sound barrier, war hero Captain Chuck Yeager receives the chance to fly the X-1. While on a horseback ride with his wife Glennis, Yeager collides with a tree branch and breaks his ribs, which inhibits him from leaning over and locking the door to the X-1. Worried that he might not fly the mission, Yeager confides in friend and fellow pilot Jack Ridley. 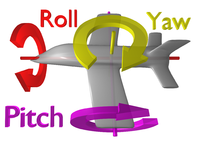 Ridley cuts off part of a broomstick and tells Yeager to use it as a lever to help seal the hatch to the X-1, and Yeager becomes the first person to fly at supersonic speed, defeating the "demon in the sky". Six years later, Muroc, now Edwards Air Force Base, still attracts the best test pilots. Yeager (now a major) and friendly rival Scott Crossfield repeatedly break the other's speed records. They often visit the Happy Bottom Riding Club run by Pancho Barnes, who classifies the pilots at Edwards as either "prime" (such as Yeager and Crossfield) that fly the best equipment or newer "pudknockers" who only dream about it. Gordon "Gordo" Cooper, Virgil "Gus" Grissom and Donald "Deke" Slayton, captains of the United States Air Force, are among the "pudknockers" who hope to also prove that they have "the Right Stuff". The tests are no longer secret, as the military soon recognizes that it needs good publicity for funding, and with "no bucks, no Buck Rogers". Cooper's wife, Trudy, and other wives are afraid of becoming widows, but cannot change their husbands' ambitions and desire for success and fame. In 1957, the launch of the Russian Sputnik satellite alarms the United States government. Politicians such as Senator Lyndon B. Johnson and military leaders demand that NASA help America defeat the Russians in the new Space Race. The search for the first Americans in space excludes Yeager because he lacks a college degree. Grueling physical and mental tests select the Mercury Seven astronauts, including John Glenn of the United States Marine Corps, Alan Shepard, Wally Schirra and Scott Carpenter of the United States Navy, as well as Cooper, Grissom and Slayton; they immediately become national heroes. Although many early NASA rockets explode during launch, the ambitious astronauts all hope to be the first in space as part of Project Mercury. Although engineers see the men as passengers, the pilots insist that the Mercury spacecraft have a window, a hatch with explosive bolts, and pitch-yaw-roll controls. However, Russia beats them into space on April 12, 1961 with the launch of Vostok 1 carrying Yuri Gagarin into space. The seven astronauts are determined to match and surpass the Russians. Shepard is the first American to reach space on the 15-minute sub-orbital flight of Mercury-Redstone 3 on May 5. After Grissom's similar flight of Mercury-Redstone 4 on July 21, the capsule's hatch blows open and quickly fills with water. Grissom escapes, but the spacecraft, overweight with seawater, sinks. Many criticize Grissom for possibly panicking and opening the hatch prematurely. Glenn becomes the first American to orbit the Earth on Mercury-Atlas 6 on February 20, 1962, surviving a possibly loose heat shield, and receives a ticker-tape parade. He, his colleagues, and their families become celebrities, including a gigantic celebration in the Sam Houston Coliseum to announce the opening of the Manned Space Center in Houston, despite Glenn's wife Annie's fear of public speaking due to a stutter. Although test pilots at Edwards mock the Mercury program for sending "spam in a can" into space, they recognize that they are no longer the fastest men on Earth, and Yeager states that "it takes a special kind of man to volunteer for a suicide mission, especially when it's on national TV." While testing the new Lockheed NF-104A, Yeager attempts to set a new altitude record at the edge of space but is nearly killed in a high-speed ejection after his aircraft went out of control in a flat spin. Though seriously burned, after reaching the ground Yeager gathers up his parachute and walks to the ambulance, proving that he still has the Right Stuff. On May 15, 1963, Cooper has a successful launch on Mercury-Atlas 9, ending the Mercury program. As the last American to fly into space alone, he "went higher, farther, and faster than any other American ... for a brief moment, Gordo Cooper became the greatest pilot anyone had ever seen." The following real people also appeared in archive footage: Ed Sullivan with Bill Dana (playing his character José Jiménez); Yuri Gagarin and Nikita Khrushchev seen embracing at a review, along with Georgi Malenkov, Nikolai Bulganin, Kliment Voroshilov, and Anastas Mikoyan in attendance; and Lyndon B. Johnson, John F. Kennedy, and James E. Webb. The real Alan Shepard also makes a brief cameo in archival footage during Kennedy's archival scenes. The real Chuck Yeager also appears briefly as a bartender. In 1979, independent producers Robert Chartoff and Irwin Winkler outbid Universal Pictures for the movie rights to Tom Wolfe's book, hiring William Goldman to write the screenplay. At Winkler's suggestion, Goldman's adaptation focused on the astronauts, entirely ignoring Chuck Yeager. Goldman was inspired to accept the job because he wanted to say something patriotic about America in the wake of the Iran hostage crisis. In June 1980, United Artists agreed to finance the film up to $20 million, and the producers began looking for a director. Michael Ritchie was originally attached but fell through; so did John Avildsen who, four years prior, had won an Oscar for his work under Winkler and Chartoff on the original Rocky. (The Right Stuff would have reunited Avildsen with both producers, and also with a fourth Rocky veteran, composer Bill Conti.) Ultimately, Chartoff and Winkler approached director Philip Kaufman, who agreed to make the film but did not like Goldman's script; Kaufman disliked the emphasis on patriotism, and wanted Yeager put back in the film. Eventually, Goldman quit the project in August 1980 and United Artists pulled out. When Wolfe showed no interest in adapting his own book, Kaufman wrote a draft in eight weeks. His draft restored Yeager to the story because "if you're serious about tracing where the future — read: space travel — began, its roots lay with Yeager and the whole test pilot-subculture. Ultimately, astronautics descended from that point." After the financial failure of Heaven's Gate, the studio put The Right Stuff in turnaround. Then The Ladd Company stepped in with an estimated $17 million. Actor Ed Harris auditioned twice in 1981 for the role of John Glenn. Originally, Kaufman wanted to use a troupe of contortionists to portray the press corps, but settled on the improvisational comedy troupe Fratelli Bologna, known for its sponsorship of "St. Stupid's Day" in San Francisco. The director created a locust-like chatter to accompany the press corps whenever they appear, which was achieved through a sound combination of (among other things) motorized Nikon cameras and clicking beetles. Shot between March and October 1982, with additional filming continuing into January 1983, most of the film was shot in and around San Francisco, where a waterfront warehouse was transformed into a studio. [Note 1] Location shooting took place primarily at the abandoned Hamilton Air Force Base north of San Francisco which was converted into a sound stage for the numerous interior sets. No location could substitute for the distinctive Edwards Air Force Base landscape, so the entire production crew moved to the Mojave Desert to shoot the opening sequences that framed the story of the test pilots at Muroc Army Air Field, later Edwards AFB. Additional shooting took place in California City in early 1983. During the filming of a sequence portraying Chuck Yeager's ejection from an NF-104, stuntman Joseph Svec, a former Green Beret, was killed when his parachute failed to open. Yeager was hired as a technical consultant on the film. He took the actors flying, studied the storyboards and special effects, and pointed out the errors. To prepare for their roles, Kaufman gave the actors playing the seven astronauts an extensive videotape collection to study. The effort to make an authentic feature led to the use of many full-size aircraft, scale models and special effects to replicate the scenes at Edwards Air Force Base and Cape Canaveral Air Force Station. Special visual effects supervisor Gary Gutierrez said the first special effects were too clean for the desired "dirty, funky, early NASA look." So Gutierrez and his team started from scratch, employing unconventional techniques, like going up a hill with model airplanes on wires and fog machines to create clouds, or shooting model F-104s from a crossbow device and capturing their flight with up to four cameras. Avant garde filmmaker Jordan Belson created the background of the Earth as seen from high-flying planes and from orbiting spacecraft. Kaufman gave his five editors a list of documentary images he needed, sending them off to search for film from NASA, the Air Force, and Bell Aircraft vaults. They also discovered Russian stock footage not viewed in 30 years. During production, Kaufman met with resistance from the Ladd Company and threatened to quit several times. In December 1982, 8,000 feet of film portraying John Glenn's trip in orbit and return to Earth disappeared or was stolen from Kaufman's editing facility in Berkeley, California. The missing footage was never found, but was reconstructed from copies. Although The Right Stuff was based on historical events and real people, as chronicled in Wolfe's book, some substantial dramatic liberties were taken. Neither Yeager's flight in the X-1 to break the sound barrier early in the film or his later, nearly fatal flight in the NF-104A were spur-of-moment, capriciously decided events, as the film seems to imply - they actually were part of the routine testing program for both aircraft. Yeager had already test-flown both aircraft a number of times previously and was very familiar with them. Jack Ridley had actually died in 1957, even though his character appears in several key scenes taking place after that, most notably including Yeager's 1963 flight of the NF-104A. The Right Stuff depicts Cooper arriving at Edwards in 1953, reminiscing with Grissom there about the two of them having supposedly flown together at the Langley Air Force Base and then hanging out with Grissom and Slayton, including all three supposedly being present at Edwards when Scott Crossfield flew at Mach 2 in November 1953. The film shows the three of them being recruited together there for the astronaut program in late 1957, with Grissom supposedly expressing keen interest in becoming a "star-voyager". According to their respective NASA biographies, none of the three was posted to Edwards before 1955 (Slayton in 1955 and Grissom and Cooper in 1956,) and neither of the latter two had previously trained at Langley. By the time astronaut recruitment began in late 1957 after the Soviets had orbited Sputnik, Grissom had already left Edwards and returned to Wright-Patterson Air Force Base, where he had served previously and was happy with his new assignment there. Grissom did not even know he was under consideration for the astronaut program until he received mysterious orders "out of the blue" to report to Washington in civilian clothing for what turned out to be a recruitment session for NASA. While the film took liberties with certain historical facts as part of "dramatic license", criticism focused on one: the portrayal of Gus Grissom panicking when his Liberty Bell 7 spacecraft sank following splashdown. Most historians, as well as engineers working for or with NASA and many of the related contractor agencies within the aerospace industry, are now convinced that the premature detonation of the spacecraft hatch's explosive bolts was caused by mechanical failure not associated with direct human error or deliberate detonation by Grissom. [Note 2] This determination had been made long before the film was completed. Both Schirra and Gordon Cooper were critical of The Right Stuff for its treatment of Grissom, who was killed in the Apollo 1 launch pad fire in January 1967 and thus unable to defend himself when the film was being made. However, Kaufman was closely following Tom Wolfe's book, which focused not on how or why the hatch actually blew, but how NASA engineers and some of Grissom's colleagues (and even his own wife) believed he caused the accident; much of the dialogue in this sequence was taken directly from Wolfe's prose. There were other inaccuracies as well, notably about the engineers who built the Mercury craft. A replica of the Glamorous Glennis which was used in filming The Right Stuff. Now on display at the Cosmosphere in Hutchinson, Kansas. The same museum has the flown Liberty Bell 7 spacecraft on display. The first group were mainly "set dressing" on the ramp while the Confederate Air Force (now renamed the Commemorative Air Force) B-29 "Fifi" was modified to act as the B-29 "mothership" to carry the Bell X-1 and X-1A rocket-powered record-breakers. A number of aircraft significant to the story had to be recreated. The first was an essentially static X-1 that had to at least roll and even realistically "belch flame" which was accomplished by a simulated rocket blast from the exhaust pipes. A series of wooden mock-up X-1s were used to depict interior shots of the cockpit, the mating up of the X-1 to a modified B-29 fuselage and bomb bay and ultimately to recreate flight in a combination of model work and live-action photography. The "follow-up" X-1A was also an all-wooden model. The U.S. Navy's Douglas D-558-2 Skyrocket that Crossfield duelled with Yeager's X-1 and X-1A was recreated from a modified Hawker Hunter jet fighter. The climactic flight of Yeager in a Lockheed NF-104A was originally to be made with a modified Lockheed F-104 Starfighter but ultimately, Wilmore decided that the production had to make do with a repainted Luftwaffe F-104G, which lacks the rocket engine of the NF-104. Wooden mock-ups of the Mercury space capsules also realistically depicted the NASA spacecraft and were built from the original mold. For many of the flying sequences, scale models were produced by USFX Studios and filmed outdoors in natural sunlight against the sky. Even off-the-shelf plastic scale models were utilized for aerial scenes. The X-1, F-104 and B-29 models were built in large numbers as a number of the more than 40 scale models were destroyed in the process of filming. The blending together of miniatures, full-scale mock-ups and actual aircraft was seamlessly integrated into the live-action footage. The addition of original newsreel footage was used sparingly but to effect to provide another layer of authenticity. The Right Stuff had its world premiere on October 16, 1983, at the Kennedy Center in Washington, D.C., to benefit the American Film Institute. It was given a limited release on October 21, 1983, in 229 theaters, grossing $1.6 million on its opening weekend. It went into wide release on February 17, 1984, in 627 theaters where it grossed an additional $1.6 million on that weekend. But despite this, the movie bombed at the box office with $21.1 million. The failure of this and Twice Upon a Time caused The Ladd Company to shut down. As part of the promotion for the film, Veronica Cartwright, Chuck Yeager, Gordon Cooper, Scott Glenn and Dennis Quaid appeared in 1983 at ConStellation, the 41st World Science Fiction Convention in Baltimore. The Right Stuff received overwhelming acclaim from critics. The film holds a 98% approval rating on Rotten Tomatoes based on 44 reviews. Film critic Roger Ebert named The Right Stuff best film of 1983, and wrote, "it joins a short list of recent American movies that might be called experimental epics: movies that have an ambitious reach through time and subject matter, that spend freely for locations or special effects, but that consider each scene as intently as an art film". He later named it one of the best films of the decade and wrote, "The Right Stuff is a greater film because it is not a straightforward historical account but pulls back to chronicle the transition from Yeager and other test pilots to a mighty public relations enterprise". He later put it at #2 on his 10 best of the 1980s, behind Martin Scorsese's Raging Bull. Gene Siskel, Ebert's co-host of At the Movies, also named The Right Stuff the best film of 1983, and said "It's a great film, and I hope everyone sees it." Siskel also went on to include The Right Stuff at #3 on his list of the best films of the 1980s, behind Shoah and Raging Bull. In his review for Newsweek, David Ansen wrote, "When The Right Stuff takes to the skies, it can't be compared with any other movie, old or new: it's simply the most thrilling flight footage ever put on film". Gary Arnold in his review for the Washington Post, wrote, "The movie is obviously so solid and appealing that it's bound to go through the roof commercially and keep on soaring for the next year or so". In his review for The New York Times, Vincent Canby praised Shepard's performance: "Both as the character he plays and as an iconic screen presence, Mr. Shepard gives the film much well-needed heft. He is the center of gravity". Pauline Kael wrote, "The movie has the happy, excited spirit of a fanfare, and it's astonishingly entertaining, considering what a screw-up it is". Yeager said of the film: "Sam [Shepard] is not a real flamboyant actor, and I'm not a real flamboyant-type individual ... he played his role the way I fly airplanes". Deke Slayton said that none of the film "was all that accurate, but it was well done". Slayton later described the film as being "as bad as the book was good, just a joke". Wally Schirra said, "They insulted the lovely people who talked us through the program - the NASA engineers. They made them like bumbling Germans". Scott Carpenter felt that it was a "great movie in all regards". When the film came out, the former (and future) astronaut Senator John Glenn of Ohio was running for the Democratic nomination for President of the United States. In the weeks before the movie's premiere, media pundits as well as people in the Democratic Party wondered that if the film became a big success, it could give Glenn an advantage in the upcoming primaries, a speculation that eventually proved groundless. The Right Stuff won four Academy Awards: for Best Sound Effects Editing (Jay Boekelheide), for Best Film Editing, for Best Original Score and for Best Sound (Mark Berger, Tom Scott, Randy Thom and David MacMillan). The film was also nominated for Best Actor in a Supporting Role (Sam Shepard), Best Art Direction (Art Direction: Geoffrey Kirkland, Richard Lawrence, W. Stewart Campbell and Peter R. Romero; Set Decoration: George R. Nelson), Best Cinematography (Caleb Deschanel) and Best Picture. The movie was also nominated for the Hugo Award for Best Dramatic Presentation in 1984. Scott Glenn was also nominated for the New York Film Critics' Award for Best Supporting Actor. On June 23, 2003, Warner Bros. released a two-disc DVD Special Edition that featured scene-specific commentaries with key cast and crew members, deleted scenes, three documentaries on the making of The Right Stuff including interviews with Mercury astronauts and Chuck Yeager, and a feature-length PBS documentary, John Glenn: American Hero. These extras are also included in the November 5, 2013 release of the 30th Anniversary edition, which also includes a 40-page book binding case, with the film in Blu-ray format. The extras are in standard DVD format. In addition, the British Film Institute published a book on The Right Stuff by Tom Charity in October 1997 that offered a detailed analysis and behind-the-scenes anecdotes. Although an album mix had been prepared by Bill Conti in 1983 (and indeed the poster contains the credit "Original Soundtrack Available On Geffen Records"), the soundtrack album release was cancelled following the film's disappointing box office. In 1986, Conti conducted a re-recording of selections from the score and from his music for North and South, performed by the London Symphony Orchestra and released by Varèse Sarabande The original soundtrack was released by Varèse Sarabande on September 20, 2013, prepared from the 1983 album mix (as the original masters of the complete score were lost). ^ Downtown San Francisco doubled for Lower Manhattan in the ticker-tape parade scene after John Glenn's return to Earth. The scene was shot at the intersection of California and Montgomery Streets in the Financial District, and the Pacific Stock Exchange on the corner of Sansome and Pine Streets can be spotted doubling for the New York Stock Exchange in the final part of the scene. ^ Schirra proved that activating the hatch explosives would have left a large welt on any part of the body that came in contact with the trigger. He proved this on his Mercury flight when he intentionally blew the hatch on October 3, 1962 when his spacecraft was on the deck of the recovery carrier. ^ This allusion to Beemans chewing gum was later included in The Rocketeer (1991). ^ "Columbia-EMI Warner: The Right Stuff". British Board of Film Classification, November 29, 1983, Retrieved: October 16, 2013. ^ "Library of Congress announces 2013 National Film Registry selections" (Press release). Washington Post, December 18, 2013. Retrieved: December 18, 2013. ^ a b c d e f g h i j k Ansen, David and Katrine Ames. "A Movie with All 'The Right Stuff'." Newsweek, October 3, 1983, p. 38. ^ Goldman 2001, p. 254. ^ Goldman 2001, p 257. ^ Goldman 2001, p. 258. ^ a b c d Wilford, John Noble. "'The Right Stuff': From Space to Screen." The New York Times, October 16, 1983. Retrieved: December 29, 2008. ^ a b c Williams, Christian. "A Story that Pledges Allegiance to Drama and Entertainment." Washington Post, October 20, 1983, A18. ^ Farmer 1984, p. 34. ^ Farmer 1984, p. 41. ^ Note that Yeager's ejection was from the highly specialized NF-104 rocket jet, while the movie used a common unmodified F-104. ^ Farmer 1983, p. 47. ^ Young, Dr. James.. "Mach Buster." Air Force Flight Test Center History Office, 2014. Retrieved: July 14, 2014. ^ "Chuck Yeager, in his our words, regarding his experience with the NF-104." Check-six.com, April 23, 2014. Retrieved: July 14, 2014. ^ "Jack Ridley." Nasa September 18, 1997. Retrieved: July 14, 2014. ^ "Famed aviator Scott Crossfield dies in plane crash." The Seattle Times, April 19, 2006. ^ Gray, Tara. "Donald K. 'Deke' Slayton". NASA. Retrieved: July 14, 2014. ^ a b Zornio, Mary C. Virgil Ivan 'Gus' Grissom." NASA. Retrieved: July 14, 2014. ^ Gray, Tara. "L. Gordon Cooper, Jr." NASA. Retrieved: July 14, 2014. ^ a b Buckbee and Schirra 2005, pp. 72–73. ^ Buckbee and Schirra 2005, p. 72. ^ Cooper 2000, p. 33. ^ Wolfe 1983, chapter 10 "The Unscrewable Pooch". ^ Ebert, Roger. "The Right Stuff" Roger Ebert.com. Retrieved: July 14, 2014. ^ a b Farmer 1983, p. 49. ^ a b c Farmer 1983, pp. 50–51. ^ Farmer 1983, p. 51. ^ Farmer 1984, pp. 72–73. ^ Farmer 1984, p. 66. ^ Morganthau, Tom and Richard Manning. "Glenn Meets the Dream Machine." Newsweek, October 3, 1983, p. 36. ^ a b Arnold, Gary. "The Stuff of Dreams." Washington Post, October 16, 1983, p. G1. ^ "1983 World Science Fiction Convention." fanac.org, 2012. Retrieved: September 5, 2012. ^ "The Right Stuff". Rotten Tomatoes. Fandango Media. Retrieved October 13, 2018. ^ Ebert, Roger. "'The Right Stuff'." Chicago Sun-Times, October 21, 1983. Retrieved: December 29, 2008. ^ Ebert, Roger. "'The Right Stuff': Great Movies." Chicago Sun-Times, March 16, 2002. Retrieved: December 29, 2008. ^ "At the Movies-Best of 1983." Youtube. Retrieved: May 14, 2013. ^ Kael, Pauline. "The Sevens". The New Yorker, October 17, 1983. ^ a b c Bumiller, Elisabeth and Phil McCombs. "The Premiere: A Weekend Full of American Heroes and American Hype." Washington Post, October 17, 1983, p. B1. ^ Slayton 1994, p. 317. ^ "The 56th Academy Awards (1984) Nominees and Winners." oscars.org. Retrieved: October 10, 2011. ^ "'The Right Stuff'." The New York Times. Retrieved: January 1, 2009. ^ "1984 Hugo Awards." thehugoawards.org. Retrieved: September 5, 2012. ^ "The Right Stuff/North and South." AllMusic. Retrieved: July 15, 2015. ^ "The Right Stuff Soundtrack." AllMusic. Retrieved: February 2, 2014.